Jacksonville is fast making a mark on the tourism market. People come to see the art museums, like Cummer and Museum of Contemporary Art (MOCA). They visit TIAA Bank Field to see the Jaguars play football. They ride the River Taxi from The Landing for a Sunset Cruise or over to see The Museum of Science & History (MOSH) but they often miss the original Jacksonville. Located in the northeastern corner of Duval County, Timucuan Ecological and Historical Preserve, a 46,000 acre area, protects some of the most environmentally sensitive marsh and waterfront land in the state. This is where the Saint Johns River and Nassau River, Jacksonville/Duval County's northern boundary, merge into the Atlantic Ocean. It's a treasury preserving a tiny bit of North Florida the way it was when the first settlers stepped ashore. Another treasure is there; the preserve encloses some of Florida's earliest history. Had the winds of fortune blown differently (literally), Jacksonville would be America's oldest city. 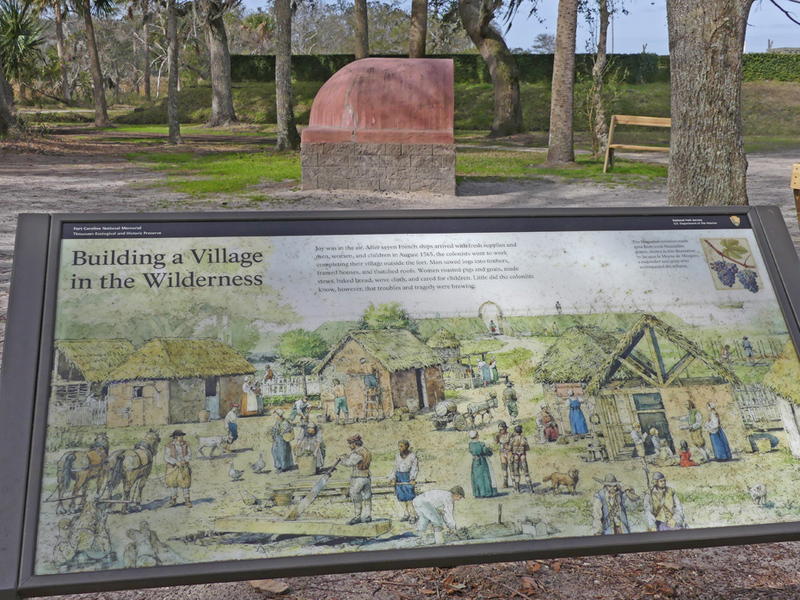 About a year before Pedro Menendez established St. Augustine, French Huguenots settled here. 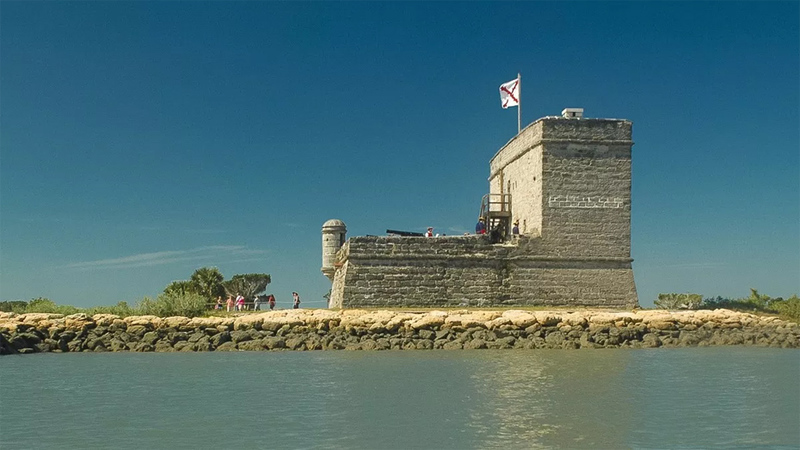 They called their settlement Fort Caroline in honor of the French King Charles IX. When the Spanish Catholics came to settle Florida, conflict was inevitable. Both men were charged with claiming Florida for their respective countries. On September 5th, the two men made first contact, Menendez on his San Pelayo and Ribault on his flagship Trinity. A few shots were fired and the French slipped away. Menendez returned to San Augustine. The two colonies were just about 38 miles south apart. Realizing their vulnerability, Menendez sent his big galleons that could not cross the shallow harbor bar, back to Santo Domingo on September 10th. Ribault pursued the departing Spanish vessels. A sudden Florida hurricane blew into the French ships and wrecked them. Menendez, realizing Ribault could not return to Fort Caroline in time to prevent an attack, marched his men overland to Fort Caroline. Menendez captured it without any losses. Of the 240 Frenchmen, the Spanish killed 132, sparing only a handful of Catholic Frenchmen. A few escaped but the victory was overwhelming. Meanwhile, two separate groups of shipwrecked Frenchmen were walking through woods and swampland back towards Fort Caroline. When Menendez learned of this, he marched south with about 50 to 70 men. They found the first group of 126 drenched despairing Frenchmen near the south end of Anastasia Island. There, at a small inlet, he encountered the first contingent. With little choice, they surrendered to him. Menendez ordered all killed with the exception of 15 Catholics. On October 12th, Ribault and remaining 350 Frenchmen reached the inlet. About half of the Frenchmen surrendered and the rest decided to take their chances in the woods rather than trust Menendez. All but 16 prisoners were rounded up and slaughtered in the already bloody marsh. Today, that inlet is called Matanzas, Spanish for slaughter. Because of an ill wind, France forever lost her chance in Florida. There would not be another town here until 1822, the year after Spain ceded Florida to the United States. It was originally known as known as Cowford because this was where the settler drove their cattle across the St. Johns River. 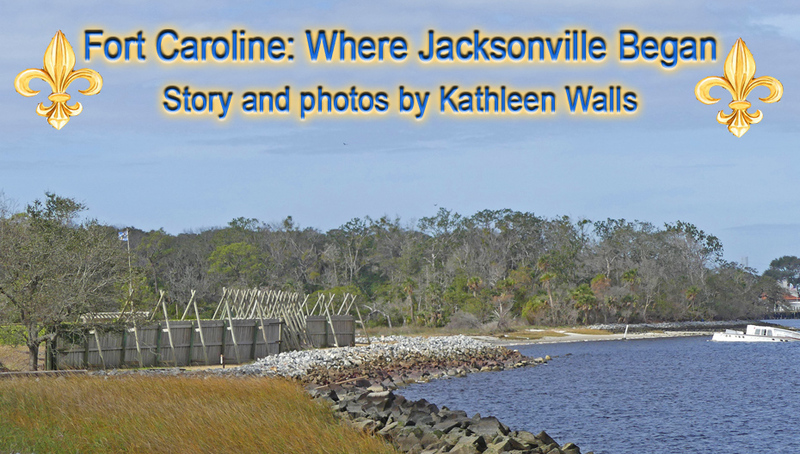 Then in 1822, it was mapped as a town and named Jacksonville after Andrew Jackson, Florida Territory's provisional governor. 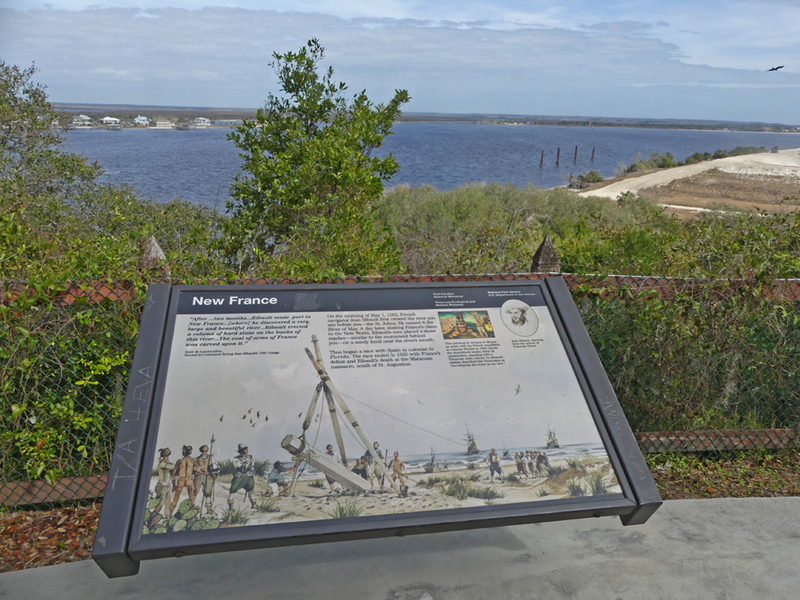 Fort Caroline National Memorial memorializes the short-lived French presence in sixteenth century Florida. 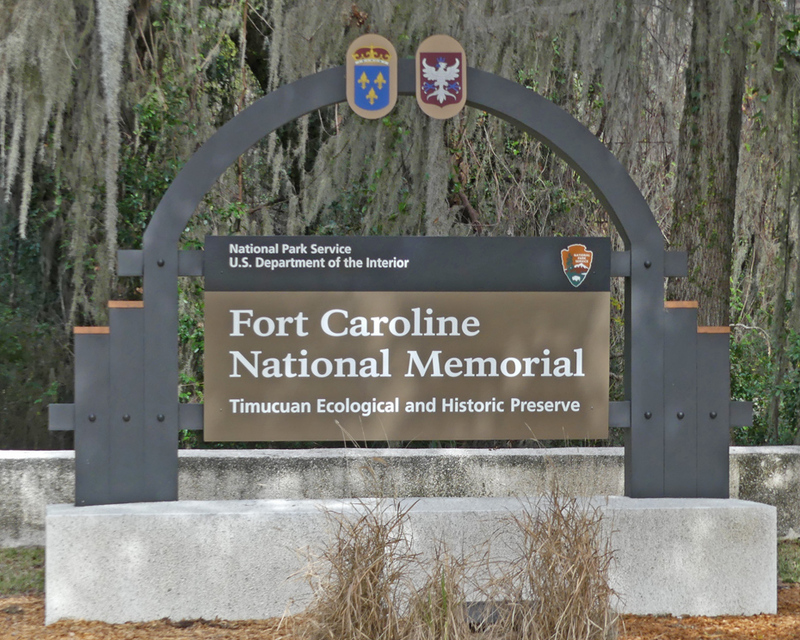 The site hosts the visitor center and a small museum that tells the history of Fort Caroline's French Huguenot settlers, the early Timuquan Native Americans influence, and the ecological factors of this land. It's open 7 days a week is from 9 am to 4:45 pm. 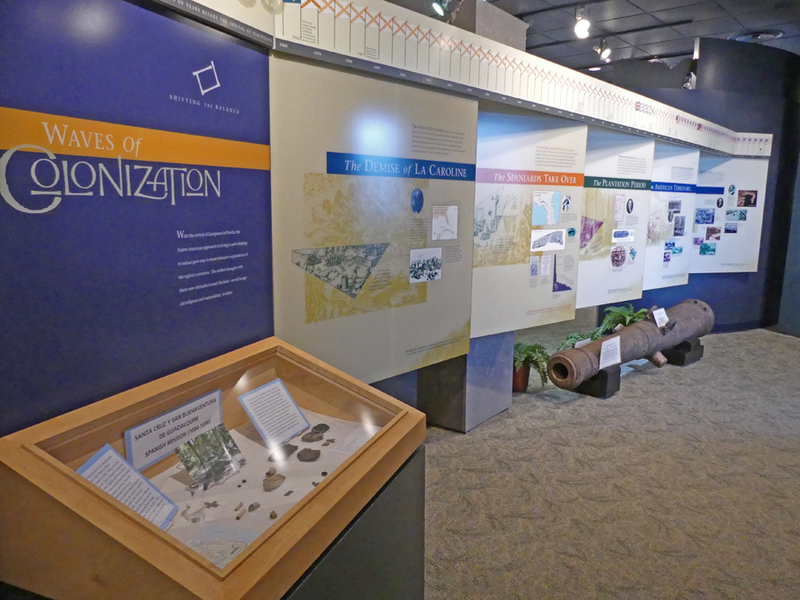 The displays inside tell of the settling of Jacksonville and have many actual artifacts. When the French settlers arrived, the Timucuans helped the settlers acclimate to this new wild land. 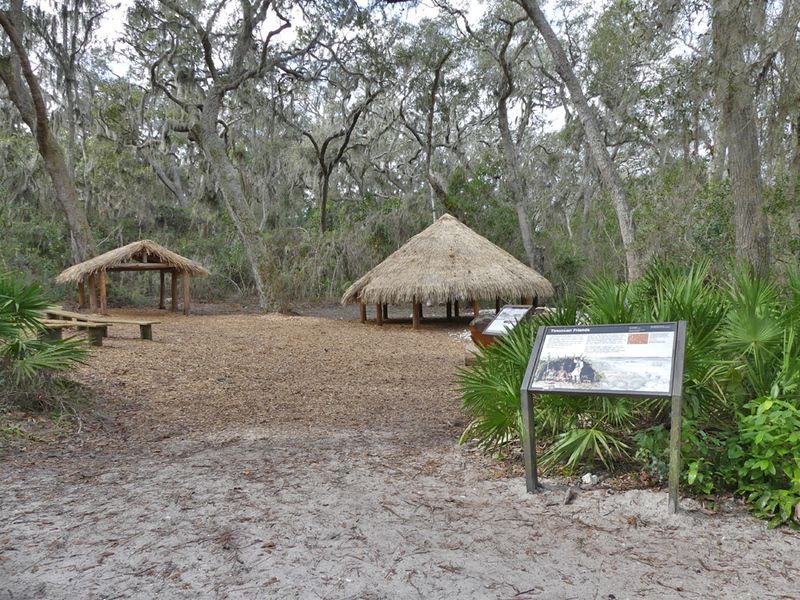 The Timucuans knew how to use nature's resources; shells for tools, fiber and baskets were created from saw palmetto, logs were hollowed to make dugouts. Because of the huge water resources, fish and shellfish were a main source of food. The French landed named the huge river The River of May. Today we call it the Saint Johns River. Nearby Mayport memorializes that earlier name. The reconstructed Fort Caroline shows how the settlers built a village here. There's a replica of an oven. Ovens were built outside the fort to prevent the fire from igniting gunpowder. 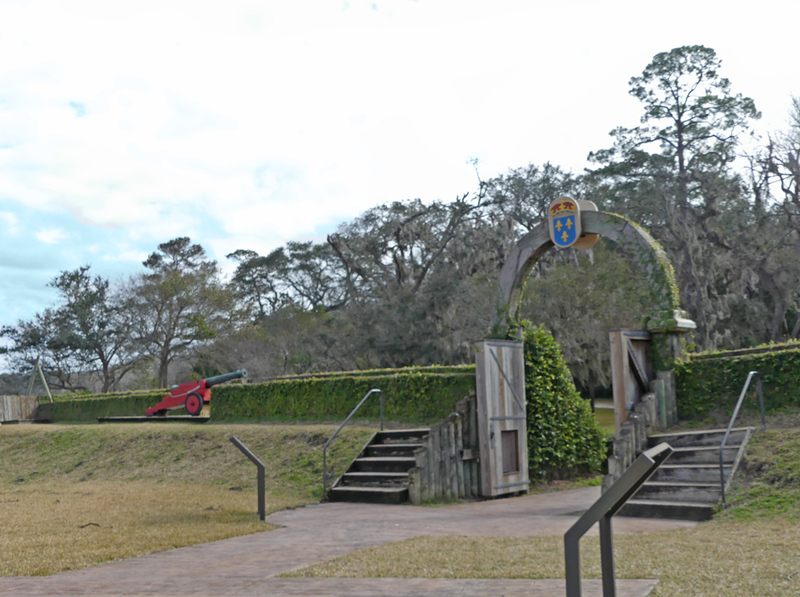 There's a replica of a Timucuan home and shelter with a Timucuan dugout You enter the fort through gates with a French coat of arms. You'll see the cannon replicas that were supposed to protect the fort. This fort replica is about one third the size of the original fort. Just a short distance away, Ribault Monument stands overlooking the St. Johns River. 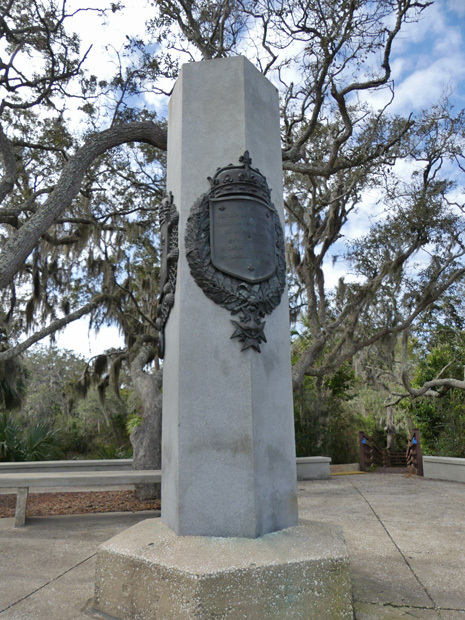 It replicates the stone column Ribault erected, bearing the coats of arms of the French king and claiming Florida for France, in 1562. 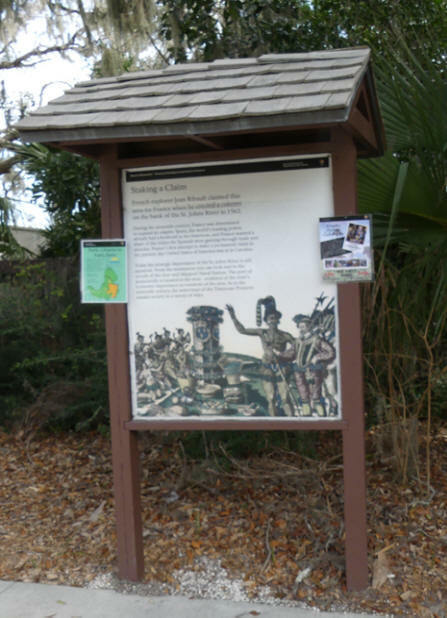 The native Timucuans often decorated the marker and revered it. Next time you visit Jacksonville, go see where it all started.